THEN 50% of revenue will be committed to improving the store's environmental sustainability by cutting electricity usage up to 25%! After organising Melbourne's first and successful Carrotmob in April 2010 we wanted to give it another go in a different area. This time a couple of other people showed interest in joining the "carrotmob melbourne group" growing the organising team from 2 to 4 people. We followed the same process as the first Melbourne mob by approaching businesses and offering them a sustainability assessment and then running a competition to see who would get the mob. We like this approach because the businesses that don't win the mob still get an opportunity to learn about the green improvements they can make. 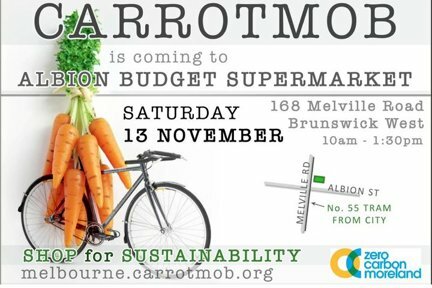 The Moreland Energy Foundation supported the Carrotmob by providing sustainability assessments to three businesses and helping to follow up and facilitate the changes committed to by the mobbed business - Albion Budget Supermarket. Despite the pouring rain, over 100 people came to 'mob' the Albion Budget Supermarket to shop for sustainability. The mob made a massive impact, more than doubling the store's average Saturday sales in just 4 hours. $700 was raised from the mob to make energy efficiency changes in store but the business owner, Medhat Ghaly, decided to commit a further $750 to cover the costs of a full lighting efficiency conversion in his store. Medhat is now continuing to work with the Moreland Energy Foundation, trialing the use of fridge timers for his drink fridges.